UK supermarket Asda has an online shopping tool, which users must register to use. After a postcode check to ensure that home delivery is an option in their area, customers are presented with a ‘Create an account’ overlay which presents a simple form requesting an email and password along with a very few additional details. A prominent yellow panel above the password fields clearly outlines the password requirements for the site, including the number and type of characters it should include (eight characters minimum, at least three of: uppercase character, lowercase character, a symbol, a number). Another option allows visitors to see passwords as they write them. We regularly come across registration forms – on job application tools, for instance – which invite users to suggest a password and only tell them after they have submitted the form that their choice does not meet the parameters. In too many cases this frustration is compounded as the site returns the form stripped of all previously entered data (which can be substantial on some job tools) or offers no information about why the password has been rejected. 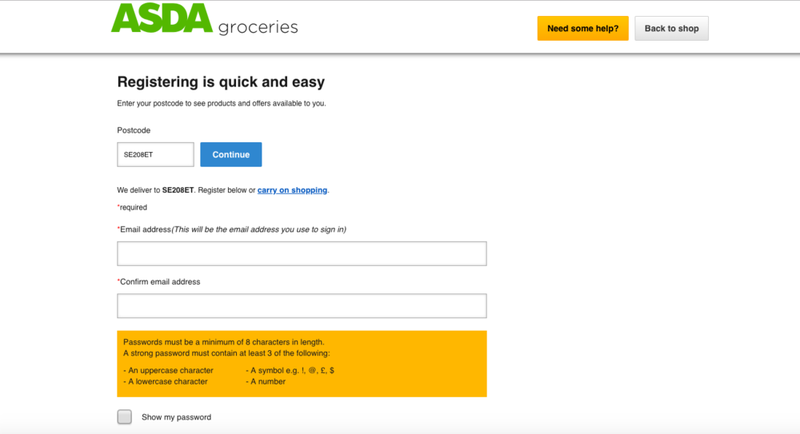 By providing very clear guidance about password parameters before users submit their form Asda is avoiding a potentially frustrating feedback loop, which not only improves the customer experience but also reduces the likelihood of abandoned registrations. Simple, but no less useful for that.